Experience the magic of the ocean at night, after the hustle and bustle of the day ends and stillness falls upon the evening. The calm, dark water is lit up by our underwater lights in beautiful fluorescent blue, green, purple, and red colors. 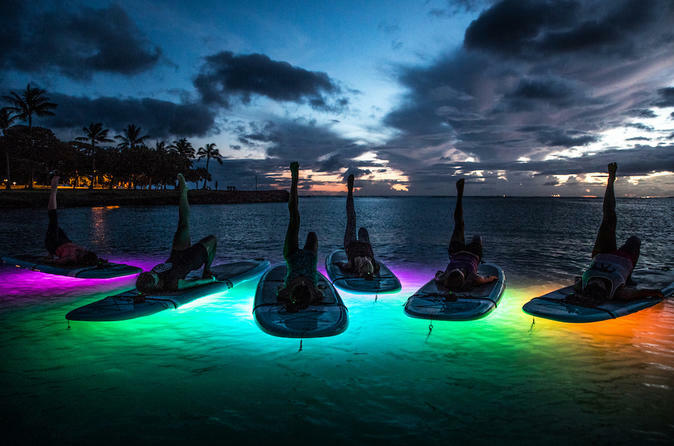 We keep our practice slow and calm, allowing ourselves to move intentionally as we take in the beauty of the city lights and the glowing ocean waters. We meet in the parking lot of Magic Island at Ala Moana beach park. We start with a brief introduction on land, discussing safety and positioning on the boards. We make our way to the water and drop anchor in waist-deep water. We begin our practice with a short meditation, getting calm and centered and connected to the water and our surroundings. We begin our practice slowly and move through a gentle hatha practice. Most people do not fall in, but it is a possibility :) We will leave some time at the end of class for anyone wanting to try some more challenging poses. The conclusion of the class is a blissful floating savasana, where you are free to relax and find stillness on the night water.